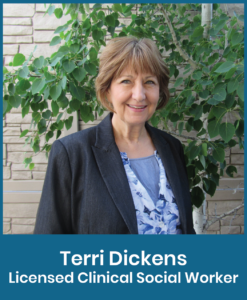 Terri was Clinical Director for a behavioral health clinic and served as the Quality Assurance Manager for the same clinic while seeing a full caseload of clients. She then worked for Greater Oregon Behavioral Health Incorporated (GOBHI) in Care Management, Utilization Management, and Integration of Behavioral Health into Primary Care. She was the Project Director for a Federal Grant promoting Mental Health in schools for Intermountain Education Service District, where she worked for 16 years. Although she has lived in many places and served in the U.S. Army, Terri was born in Grant County, Oregon. She is a client centered, strength based therapist, and believes in client voice and choice as well as understanding the myriad of circumstances that affect people’s medical and emotional conditions and the effects on care, making primary team based care a perfect fit for her.